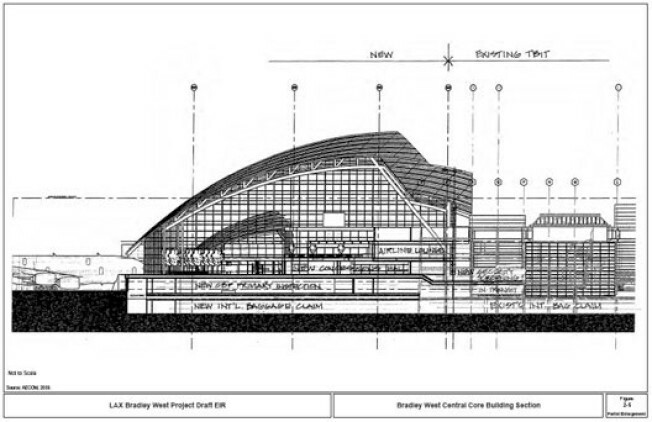 Prepare yourself for some killer airport layout action--Los Angeles World Airports has released a final Environmental Impact Report for the Tom Bradley International Terminal renovation that will turn the terminal into Bradley West (so much sleeker). The proposal, part of the larger LAX Master Plan (all of which is being designed by Fentress Architects), calls for the demolition of the concourses and the construction of two new concourses (north and south) just west them. The US Custom and Border protection area and the concession area in the core of the terminal will both be renovated and enlarged, and there will be new corridors for security-cleared passengers to travel between Terminals 3 and 4 and Bradley. There will be nine new gates, some relocation and consolidation of gates, and some taxiways will be moved west. The Argonaut reports that the plan is to start construction on the new north concourse in January, to be completed in January 2012, with the south concourse done in September or October 2012, and the core building in April 2013. The Argonaut also has news of current construction action at Bradley--part of the north side lower arrivals level is closed through January 21 for renovations, which "include new glass paneling, curved LED (light emitting-diode) media and entertainment zones and modern storefronts."